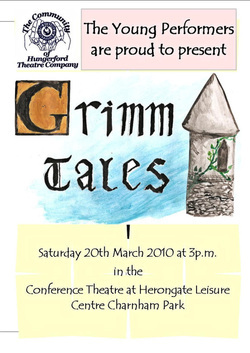 "Well done to the Young Performers of the CHTC for an excellent show in "Grimm Tales" at the Herongate Leisure Centre. Adult amateur performers sometimes find it difficult to perform in front of an audience so what these 5 - 8 year olds achieved was amazing. Well produced and directed Roushka, you should be proud of them. Also, well written Hoffi and well done to all those who helped with scenery, sound, lighting and front of house. I really enjoyed it all". 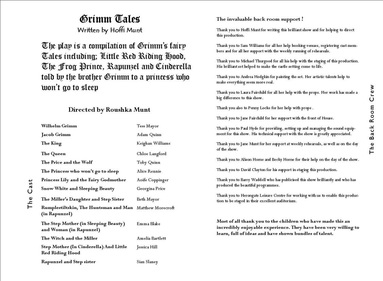 ''Grimm Tales'' was written by Hoffi Munt, Directed by her sister Roushka and was excellently performed by the Young The show is a compilation of Grimm's fairy tales including; Little Red Riding Hood, The Frog Prince, Rapunzel and Cinderella told by the brothers Grimm to a princess who won't go to sleep......... .